Sneeking. 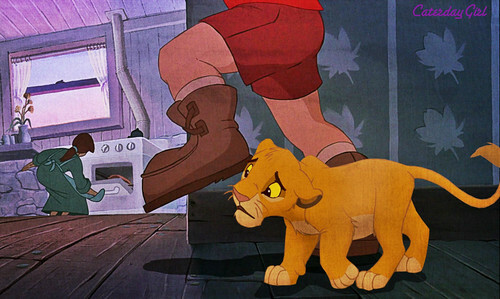 Cody has a lion cub in his room and tries to sneek out of the house without his mom noticing.. HD Wallpaper and background images in the Disney crossover club tagged: disney crossover cody simba. This Disney crossover photo contains anime, comic kitabu, manga, cartoon, and mkono. There might also be ishara, bango, maandishi, ubao, matini, ubao wa chokaa, hip boot, thigh boot, tights, and leotards.